This Sog PowerAssist EOD S67 is known because it has two assisted opening blades in one handle. The plier jaws are geared such that your sqeezing force is doubled while you effortlessly cut your way through heavy things like thick wire. With the patent pending piano lock system you will love how each tool locks and releases individually. The SOG PowerAssist EOD has the following components: straight and serrated knife blades, 3-sided file, large screwdriver, can opener with small screwdriver on the tip, wire crimper, wire cutter, blasting cap crimper, compound leverage system, comfort grips, C-4 Punch, and a sheath. Sheath included will be either leather or nylon. Sorry but we are unable to fulfill requests for sheath type. 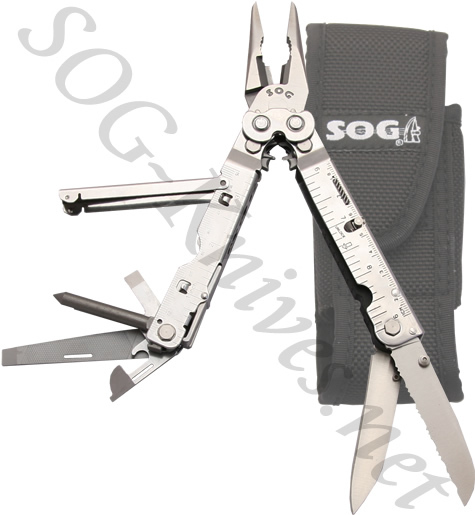 Own a SOG PowerAssist EOD Multitool S67? Tell us how you like it! Got a question? Ask! Somebody will answer!